After 10 days of fresh food during my jaunt to Israel, I decided to learn how to cook. I'm probably the least domestic person you'll ever meet - my boyfriend can attest to this - so my friends were quite skeptical when I announced my latest project. As any undomestic goddess knows, it's always best to start off slow when venturing into the kitchen. 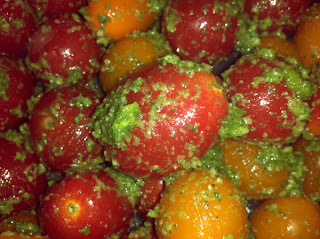 Rather than attempt to bake a peach pie from scratch, I decided to start with pesto. After having quite a bit of basil and pesto in Israel, I decided it would be the perfect first dish to create. - Combine basil with pine nuts and pulse a few times in the food processor. - Add the garlic and pulse a few more times. - Slowly add the olive oil in a constant stream while the food processor is on. - Add the grated cheese and pulse again until mixture is blended.